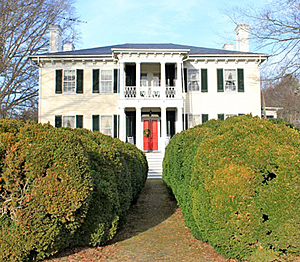 A friend’s charming B&B in Northern Neck VA.
We started in the Virginia Tidewater area. We couldn’t find anything happening there yet with artisan chocolates. There are a couple of traditional candy makers in Virginia Beach, which we skipped. Instead we indulged in traditional Southern Christmas fare and made the usual dietary New Year’s resolutions. A scenic drive through Virginia’s Northern Neck (which has great roads, but no artisan chocolate yet) ended in Fredericksburg, where I had the best cup of coffee in my life (Woodchoppers Dark Roast at the Daily Grind Unwind), but still no artisan chocolates. The coffee shop carried DeFluri’s Fine Chocolates, another traditional candy maker, which makes an interesting sounding option: dark chocolate covered soybeans. We tried those and their dark chocolate S’Mores, but the chocolate was not satisfying. On a quick trip up to Baltimore, we sampled the truffles from A. Kirchmayr Chocolates, which we’d been told were the first artisan chocolates in the area. Ummm, no. First sign of trouble: Service was brusque, which on this trip proved to mean ‘Save your money, skip these chocolates.’ The truffles were attractive looking, but the shells were almost tooth-breakingly hard and the inner ganaches were not worth the exertion to me. 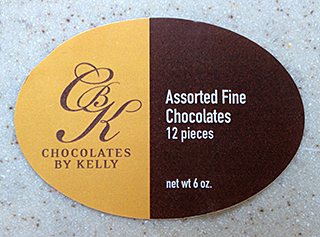 Ronnie described them as “coffee table chocolates” — chocolates people give as gifts but never eat. 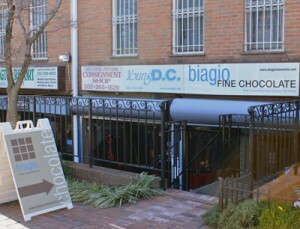 If you only have time to visit one place in D.C., make it The Chocolate House (formerly Cocova, formerly Biagio Fine Chocolate) (1904 18th St. NW, Washington, DC 20009/Tel- 202.328.1506). In the Adams Morgan neighborhood, it isn’t the easiest place to find: It’s a basement storefront, they don’t open until noon, and they’re closed Mondays. But it’s worth it. 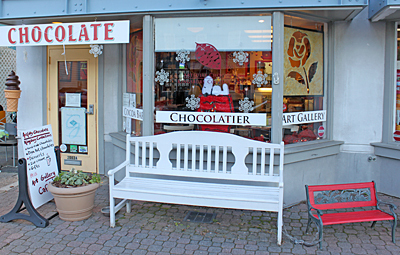 Large selection of local artisan chocolates and a knowledgeable pleasant staff. Do not pass this one by. Our fav was the Gingerbread, which had a strong gingerbread taste in a smooth, soft ganache. A strong second was the Warm Clove. They also carried some SF chocolates, Recchiutti and Guittard, if you get homesick. And world chocolates, including Michel Cluizel and Valrhona, if you miss Paris. 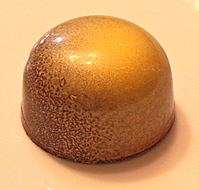 Artisan Confections’ Salted Butter Caramel. Yes! Locolate Cafe, 1781 Florida Ave. NW, Washington, DC 20009. Tel: 202-518-2570. Around the corner from Biagio and much easier to find, but service was brusque, which again translated into less-than-yummy chocolates. 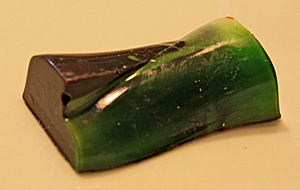 The chocolate candies looked great in the lit display cases: the green tea and lime chocolates glowed like neon, but maybe we just aren’t into Belgian-style chocolates: The shells were thin and didn’t give us a big chocolate taste. Fillings in those we sampled were overly sweet, and the Caramel Banana — while it had a good banana taste — was filled with partially crystalized sugar (! ), not ganache and not quite liquid either. The gritty texture was unexpected and not something I’ll try again. 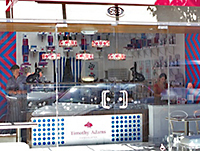 Most of their space was devoted to the cafe part of the business, maybe that’s their stronger suit. 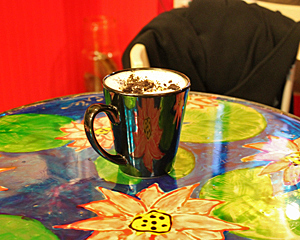 It may look crazy, but this is a great place for a cup of hot chocolate. The next day’s chocolate excursion gets our enthusiastic recommendation. Clockwise from left: The Liz, Eartha Kitt and The Lucy. ACKC, 2003A Mt. Vernon Ave., Alexandria, VA 22301. UPDATE 12/2014: This location is closed. Cute, tiny space decorated with the owner’s colorful artwork (even the tabletops). Nice, friendly staff. Most importantly: delicious hot chocolate and handmade truffles. It was the perfect place to get out of the cold and catch up with friends. 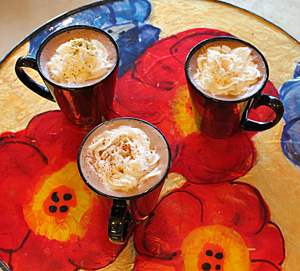 The hot chocolates, named after famous American women, are called diva drinks. We tried The Lucy, semi-sweet chocolate with chipotle and cinnamon; The Liz, semi-sweet chocolate with lavender and pistachios; Eartha Kitt, semi-sweet chocolate with toffee; and Marilyn Monroe, white chocolate with crème de menthe and crumbled Oreo cookies. These are grown-up drinks — not too sweet, with subtle combinations that all tasted great. I look forward to visiting again and getting to know the other divas. In warm weather, they re-create the divas in ice cream sundaes. 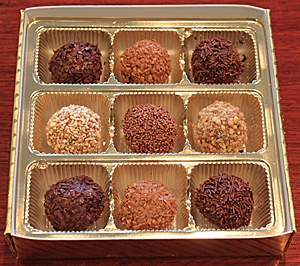 And some of their handmade truffles share the same flavors, such as the Chipotle Cinnamon, which had a strong cinnamon start and ended with warm chipotle like The Lucy. The Marilyn looks like a work of art. We arrived the week after Christmas, and the chocolate cases were a little bare. It had been a good Christmas for them, the owner was busy making new stock, but there was still enough for us to get a good sample. Champagne, flavored with cognac and dusted with gold leaf, was smooth and soft. It rated +++ with us. Brie with toasted black sesame seeds had a real Brie flavor that combined well with the dark chocolate and sesame. Unusual, but good. I wish someone in SFBA was making these too. Our final stop was Richmond, VA, where the artisan chocolate scene is on the scale of blink-and-you’ll-miss-it. Of course, we were only in town for a hot minute, but friends supplied us with some handmade chocolate bars from Chocolate Cravings. The bars looked interesting: big, irregularly shaped bars of dark chocolate, some with big bits of stuff scattered over them — kind of like the rough, handmade pottery version of artisan chocolates. Kudos for that, but taste- and texture-wise, most of the bars fell short for us. The Crystalized Ginger had the wrong ginger. It tasted like the pickled ginger you get with sushi, not the candied, crystallized ginger we expected. The Lime Sea Salt was too salty and sweet for us. Maybe we’ve lived on the West Coast too long and have lost our taste for Southern seasoning. Smokey Sea Salt Almond was also too salty for us, but the Dark Chocolate Coffee was a winner, good coffee/mocha taste with a cute white-stamped pattern of coffee beans on it. Phew! Richmond redeemed. Of the many stops on our too-short trip, I’d have to say D.C. is the most happening in terms of artisan chocolate right now. Plus Obama’s in the White House, so it gets my vote for Chocolate City — of the Mid-Atlantic Region. Plenty of room to grow though. I look forward to future trips to check out other places and re-visit Biagio and ACKC. Date posted: January 28, 2010. 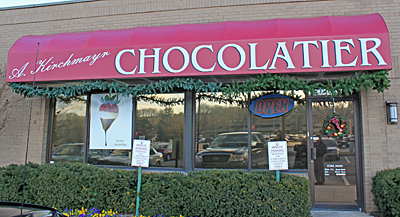 This entry was posted in American chocolate, Chocolate around the World, Outside the Bay Area, Review, Update and tagged Alexandria, artisan, Baltimore, banana, Belgian, blackberry, brie, calavados, champagne, chipotle, chocolate, cinnamon, clove, coffee, cognac, crème de menthe, DC, ginger, gingerbread, gold leaf, gooseberry, green tea, Guittard, handmade, hot chocolate, lavender, lime, Maryland, Michel Cluizel, mocha, Paris, peanut butter, pistachio, raspberry, Recchiuti, Recchiutti, Richmond, sesame, toffee, truffles, Valrhona, Virginia, Washington. Bookmark the permalink. 2 Responses to DC: Chocolate city? Thanks so much for the invite, Eric. Although the main focus of our site is to promote SFBA chocolate, when we travel we like to check out what local chocolatiers in those areas have to offer and report our findings. We will be sure to visit you when we are in the area. We appreciate the info. Sounds like you’re making some good chocolate!